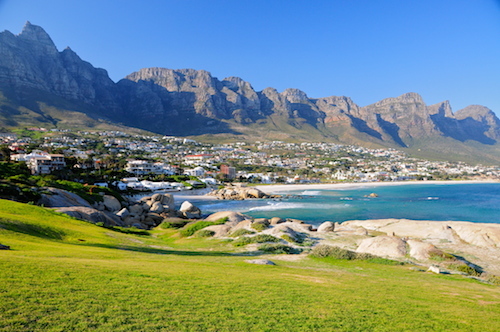 Our South Africa Property Guide will tell you all about housing in South Africa, list the best property search websites, share insights regarding renting and buying property as well as provide tips on finding your dream home in South Africa. A wide variety of housing options is available in South Africa. The options are manifold and range from serviced flats or furnished studios, shared accommodation and unfurnished apartments to furnished as well as unfurnished cottages, townhouses, villas or even mansions. Living in a gated estate is an option popular with many foreigners and expats, but this is not necessary in many suburbs or popular tourist areas. Tenants and buyers do not pay the agent fees, as these are payable by the landlord or seller. Always check if your agent is registered with the Estate Agencies Affairs Board or the Institute of Estate Agents in South Africa. Most foreigners moving to South Africa on a temporary visa will opt to rent long-term accommodation during their stay. Residential leases are regulated in South Africa by the Rental Housing Act. Rental costs depend on the size, condition and location of the rental property and additional costs for water, gas and electricity usually have to be paid by the tenant. Renting property in a scenic location, which is often preferred by foreigners living in South Africa can mean that rental costs for a three-bedroom house might amount to R20,000 or more. Lease agreements are limited to a maximum of 24 months, the tenant is required to give notice in advance if not intending to renew the lease. South Africans and non-residents can buy property in South Africa as the current laws state it. Buyers need to take into account the extra costs, which include bank fees, deeds office levies, conveyancing fees as well as the transfer duty and usually amount to 6% additional on the property's purchase price. Foreign buyers can only apply for bonds for up to 50% of the purchase price and transfer 50% from foreign funds. The transfer must be compliant with FICA regulations. 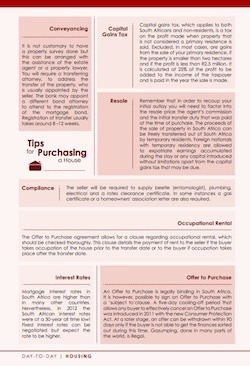 Make sure to keep your 'Deals Receipt' issued by the South African bank as you will need this document when selling the house in the future and plan to retransfer your money to a foreign country. In South Africa, there are currently no restrictions in landownership by foreigners. In February 2015, however, South African president Jacob Zuma announced proposed changes to the current South African property laws. According the proposal, foreign nationals will be allowed to lease agricultural land for 30-50 years, but not be allowed to buy land. However it is recognised that these changes can not be implemented retrospectively without constitutional infringements and thus further explanations to this new proposal can be expected. Read more. Looking for more information on housing and living in South Africa? 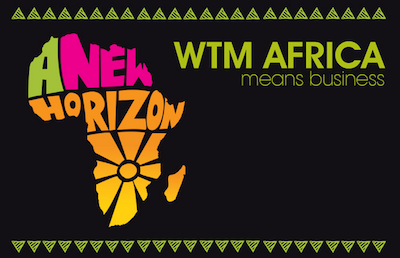 Have already joined our Living in South Africa forum on Facebook? Expats and South Africans are there for you to share their tips and insights on living in this beautiful country. For a more personalised approach, contact us here. If you need more tips regarding renting and buying property in South Africa, information on connecting to utilities and what to look out for when settling in your new home in South Africa, then make sure to get our insights and find reliable contacts for many areas. 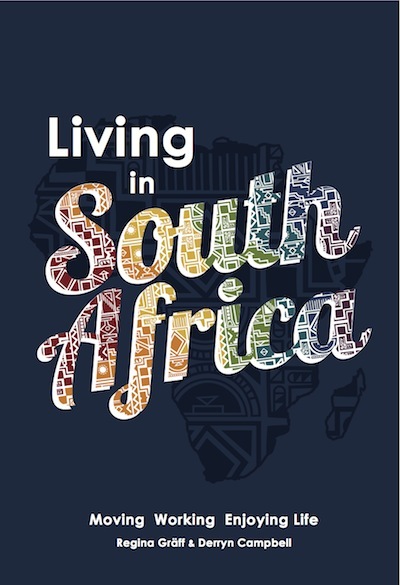 Our 'Living in South Africa' Guidebook contains 10 pages full with: house hunting tips, a buyers guide, information about access to and registration for utilities as well as important housing terms and useful resources to make your South Africa property search a successful one. Image Credits for South Africa Property Guide: shutterstock.com and own images.